Born in Carterton. Grew up on a dairy farm at Oxford, North Canterbury. Apprenticed and later qualified Carpenter and Joiner in Rangiora. Joined NZ Broadcasting service 1960. Qualified with First Class Certificate in Radio Technology. Worked at 3YZ / 3 ZA studios, Greymouth, 3YA Christchurch: Quartz Hill Receiving Station, Makara, Wellington. 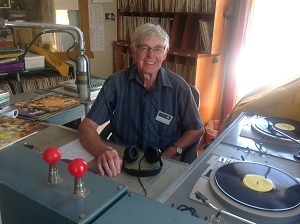 Broadcasting House Wellington, 2ZE Blenheim, and in 1976 came to Tauranga as Supervising Technician , 1ZD Tauranga. Retrained 1988 as Tauranga news journalist/reporter with Kiwi FM ( Hamilton based). Married to Dorothy with three sons, and 6 grandchildren. Other interests include, Member Matua Bowling Club, Past President Tauranga Astronomical Society. Co-ordinated purchase and installation of 14 inch telescope in the new Observatory in Fergusson Park and gardening. Currently Convener for U3A groups, History of New Zealand - The Last 1000 Years. Also member of a U3A Current Affairs Group.